Special deal on two sets. 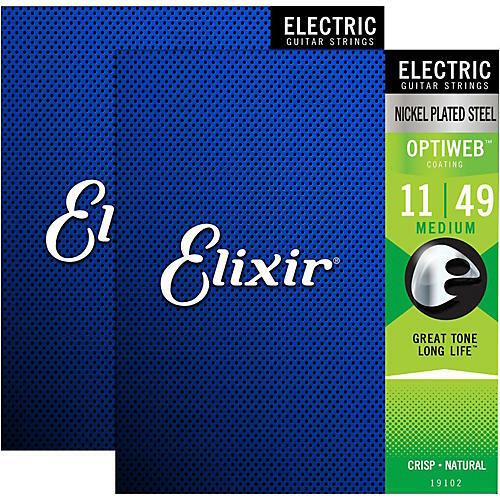 Thanks to Elixir's OPTIWEB Coating, these nickel-plated steel electric guitar strings give you the performance of a natural string—that crisp tone, natural feel and playable grip you know and love—without sacrificing the signature long-lasting tone life of Elixir Strings. Compared to their POLYWEB Coating and NANOWEB Coating, the OPTIWEB Coating offers their most natural and familiar feel. This lightweight coating allows the string to vibrate with less damping, while also having a firm grip, putting you in control of bends, vibrato and sustain.